Growing up we didn’t eat a lot of meat, it was kind of Sunday specials. 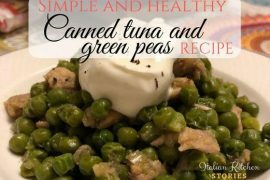 During the week we would eat veggies, rice, pasta and combinations of the above. But Sunday, boy, that way always a feast. Now I’m all grown up and I eat meat whenever I feel like it. Maybe, even a bit too much. 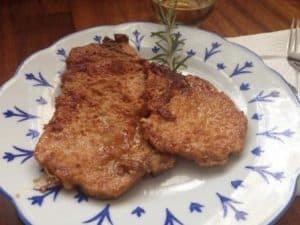 I do my fair share of experiments and I that’s how I got this delicious best pork cutlets recipe. 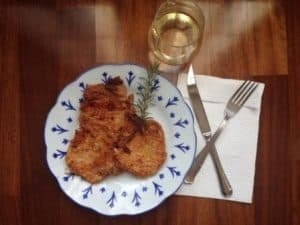 Usually, I find cutlets a bit dry and many times I overcooked them, making them taste like a shoe sole. Hahaha, it was hard to chew it even with all the mayo I have added. 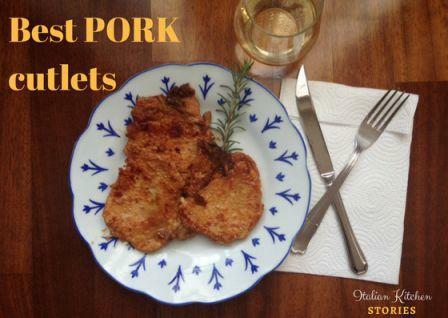 In only 3 steps you will make juicy pork cutlets. Sprinkle the meat with salt and fresh ground pepper on both sides. 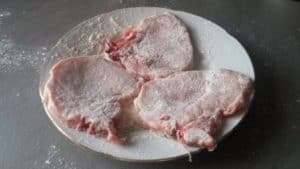 Put the pork chops in on the plate covered with flour. Turn it on both sides and let the flour cover it well. 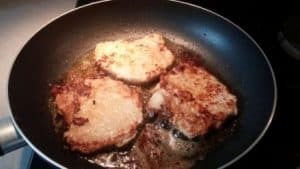 Place the cutlet in your hand and tap off the extra flour. Repeat with all your cutlets. In your frying pan add some olive oil and a cube of a butter. Let it melt slowly over low heat adding the fresh rosemary. Let It warm up bringing the flavors together. 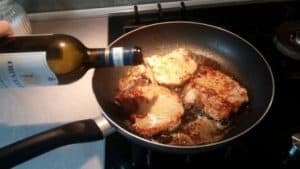 Add your cutlets in a pan and let them become golden on both sides. Add white wine and let it simmer for about a minute or two. Since I like the taste and alcohol evaporates I usually add a generous amount of wine. The sauce is just delicious. If you make more of it, you can use it to add it on top of your mash potatoes for example.